The Madagascaran spider tortoises range is the island of Madagascar. The Madagascaran spider tortoise inhabits tropical deciduous forests. Madagascaran spider tortoises are opportunistic browsers, stopping for an occasional bite to eat while moving from point to point. They do not hibernate, and they enjoy temperatures from the mid 50's to mid 80's, and an average humidity level of 77%. The tortoises require constant access to water for soaking. They are most active in the morning, shortly after sunrise, and then they seek out shade until late afternoon. They are found in the extreme southern portion of Madagascar. 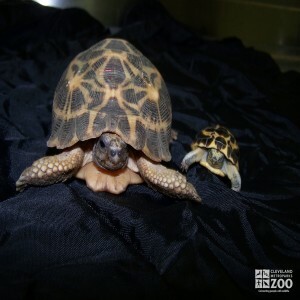 Very little information on the breeding behavior of the Madagascaran spider tortoise is known. One egg is laid.